This is a 1905 photo of the Gillespie Block building at 300 Main Street, Sarasota, Florida. A water trough is in the center of the intersection at Five Points. 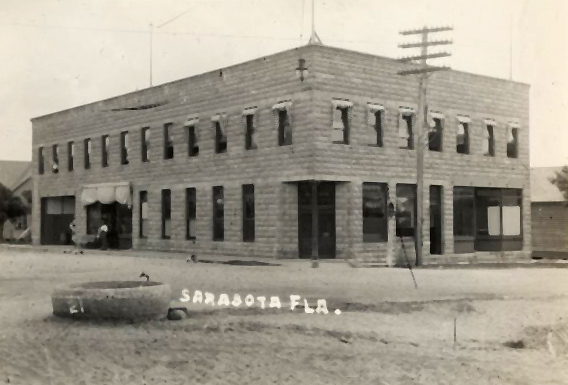 The entrance to the Bank of Sarasota is in the front corner facing Five Points. Streets are comprised of sand. One-of-two electric street lights in Sarasota is in the top center of the image. Photo courtesy of the Sarasota County History Center Collection.